We want every patient to be clear on what to expect with each remedy so each patient can decide what action best suits them. Not everyone with hair loss is a candidate for surgery. The consultation is treated as a personal exam not a sales pitch. Dr. Behnam will not recommend a hair transplant procedure if he does not feel that the patient will have a great result. If hair transplant is the best option, we are committed to being clear about the price. There are no surprise charges. Also, each patient is given specific details about after care and down time. We understand that each patient has commitments and needs. We are constantly working to improve so that our consultations and procedures are as user-friendly as possible. We give free consultations Monday through Friday after 12 noon and one Saturday a month. 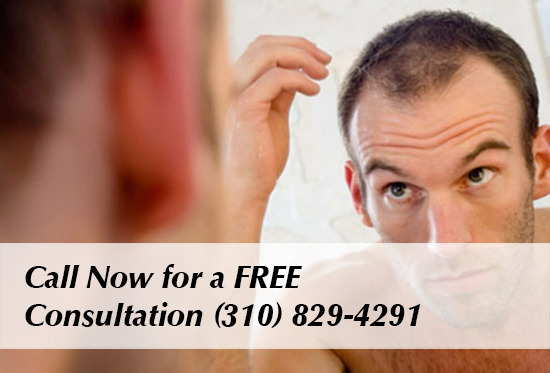 Please call 310-829-4291 to schedule a free consultation / hair loss exam. At Dermatology and Hair Restoration Specialists we understand how upsetting hair loss can be for men and women. Our goal in the consultation is to inform the patient of every option available. We understand that you want to meet with the doctor so Dr. Behnam meets with every patient in every consultation. Class 4. Front view. He had 2,083 grafts placed in one session. This level density and naturalness can be accomplished by performing only one case per day. Dr. Behnam must create the recipient holes so close to one another to create this level of density. Procedure performed by Dr. Sean Behnam. 2,153 grafts placed in the crown. After one session. Procedure performed by Dr. Sean Behnam. Great hair transplants are a combination of good planning, artistry and great execution. Before and after 2,256 grafts. Class 6. Top view. Procedure performed by Dr. Sean Behnam. Creating a natural looking hair transplant is an art. It requires patience, artistry and dedication, all of which Dr. Behnam has. This gentleman had 2,135 grafts placed in the hairline and the top midscalp. Results are after one session. Class 6. Procedure performed by Dr. Sean Bhenam. Before and after 2,113 grafts placed in one session. Front view. Class 2. Procedure performed by Dr Sean Behnam. The red line shows the distance between the eyebrows and the hairline. On the post hair transplant picture (right), you can see the forehead is smaller. This gentleman had 1913 grafts placed in the midscalp and crown area. Results after 1 session. Procedure performed by Dr. Sean Behnam. This gentleman had 2,045 grafts placed in the hairline and mid scalp. Results are after one procedure. Procedure performed by Dr. Sean Behnam. Grey hair restoration. This gentleman has purely grey hair. We specialize in grey hair. Dr. Behnam has special microscopes that are used for people with grey hair. Patient had 1,824 grafts done. Results after one session. Procedure performed by Dr. Sean Behnam. African American FUE hair transplant: This gentleman had 1,232 grafts placed int he frontal hairline. This procedure was performed by the FUE method, where individual grafts were removed one by one and placed int he frontal hairline. Los Angeles hair transplant Dr.. Sean Behnam. Class 3, thinning. This gentleman had 1,749 grafts placed in the hairline. The left picture shows how thinned the frontal hairline is before the hair transplant. The picture to the right shows how thicker the hairline is after the procedure. Dr. Behnam has designed a special tool that enables him to create recipient sites around current grafts without damaging them, thus making thinned hairline thicker. Class 3, thinning. Before and after 1,749 grafts placed in the hairline. Results after one year. As explained above, this gentleman already has a lot of hair, so Dr. Behnam has engineered a special utensil that enables him to go in between the current grafts and make the hairline thicker. Preformed by Dr Sean Behnam MD. 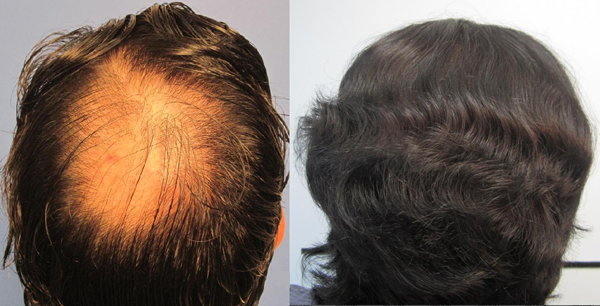 Class 3 thinning: This gentleman had 1,568 grafts placed in the hairline. Right picture shows thinning of the frontal hairline. The left picture taken one year after the procedure shows thickened frontal hairline. 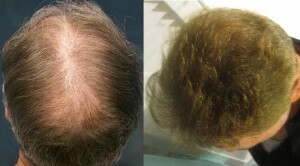 Class 3 thinning: Before and after 1,568 grafts placed in the hairline. Procedure performed by Dr. Sean Behnam MD. Dr. Behnam M.D. is dedicated to giving each patient the highest quality care. He educates each patient on the latest technologies and remedies for hair loss. He will not recommend a surgery unless he feels the patient will have a great result and will prescribe another remedy if he thinks surgery can be avoided. His one surgery a day philosophy enables him to give the attention that is needed to make each patient feel comfortable. He is an expert in the F.U.E. procedure as well as the strip procedure. He is committed to treating hair loss with the respect it deserves.